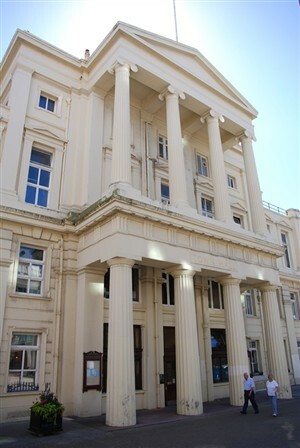 In the mid 1960s, I was a junior clerk in Brighton Town Hall. The prospect of doing this was exciting and I bought a new suit at Burton’s for £9. it is odd to think that you can still buy a suit, for a little more than this, in Asda. My first role was as a registry clerk. I then became a junior clerk in the Main Office. The person I felt most sorry for was the Committee Clerk. He was the one who took the minutes for all the important meetings in the Town Hall. He rushed back from them and busily wrote them up. He seemed to do a lot of (real) cutting a pasting, from other minutes and he always seem to be trying to catch up with himself. I vowed, then, that I would never be a Committee Clerk. Although I have since held a number of senior academic positions in a university, I realise, with relief, that I have never had to take minutes, for any meeting at all. For me, at the Town Hall, it all ended in tears. I finally got to see Mr Dodd, who told me I was not up to my job. He told me to resign or get sacked. I chose to resign and I think I felt some relief. Office work has never been high on the list of jobs I would like to do. Wasn’t Burton the fifty shilling tailor? Perhaps you were too late for that though? Good firm though. I was in that office a couple of weeks ago getting some BMD certificates. With regard to taking of minutes; They don’t do it like that now! My son-in-law goes all over the place, London, Paris, and Brussels etc recording board meetings which he then gets transposed and copies sent out to the various members. Yes, the Coffee must be at 11 o’clock and tea at four. I got a clean hands, (suit) job in 1963 for a while. All to do with learning the business! Clearly Mr Dodd was no comedian, Philip, but at least you could see the funny side of his decision, and be grateful you escaped from that particular job. I narrowly missed joining a friend there myself, and count myself fortunate that I found a job elsewhere because it led me to a very good career. Regards, Alan. Burtons and the 50 shillings tailors were two different shops. Whether they belonged to the same chain I don’t know. Thank you for an interesting article. Re The 50 Shilling suit. I think maybe this was Sammy Davies on Trafalgar street rather then Burton’s. I remember buying “off the peg” Harris tweed suits from Burton’s for 10 pound around 1964, just great for wearing to the hot and sticky Regent dance hall on a Thursday evening. Those were the days my friends. I remember Sammy Davies’ shop in Trafalgar. Sammy was a bit of a con man who never left you alone when you went in the shop but pretty much forced you to buy something. I looked at a suit and the jacket was far too big. I told him that I was worried by how baggy the jacket was. He reached round and held onto a large bundle of the cloth, so that the jacket became ‘smaller’. Then he showed me, in the mirror, how it really did fit! I was young and stupid and fell for it. Sammy had sold me a suit! I think the name was Sammy Gordon, Peter. I seem to remember another shop of his in Brighton, but can’t remember where it was at the moment. In the early to middle 1950s there were two separate branches of the Burtons and Fifty Shilling Tailors chains in Western Road. I believe, at that time, they were both part of separate businesses with branches throughout the country. The Fifty Shilling Tailors’ shop was on the north side of Western Road, somewhere between Woolworths and Wades – the department store, is my hazy recollection. Burtons shop was on the south side of the road. I remember buying my first Burtons suit in this shop in about 1953. I believe the Fifty Shillings Tailors chain was taken over a few years after this and became J.Collier. I think J. Collier eventually, became part of the Burtons group.